Over the past few weeks I've spent some time cleaning up my office/studio/general dumping ground for all things woolly. It's been a very good thing - I've found yarn I thought had gone missing, uncovered a couple of design swatches I'd forgotten about, and exposed a number of WIPs in dire need of five minutes before they are FOs. I've also found some things that I've sadly decided need to take a trip to the big frog pond in the sky. First up on the hit list is a sweater that I was really, really super excited about when I started it - Automne by Ruth Garcia-Alcantud, the cover sweater for Knit Edge Issue 4 way back in 2013. This sweater is gorgeous. Knit in a chunky weight yarn, it's nice and long, has a cool cabled waist detail, and a gorgeous wide lace collar. It's even got pockets! I immediately ordered yarn, discovered it wasn't going to work, ordered more yarn, and cast on in February of 2014. I knit most of the body over the half-term holiday that month, and then the sleeves and even managed to get everything blocked and the body sewn up and the collar knit and blocked. And then I tried it on. And realised three things: 1) my well-intentioned modifications to make sure the armholes were deep enough had resulted in sleeve caps that weren't going to fit in the armscyes; 2) that lovely cable waist detail was about four inches lower then my actual waist; and 3) most critically, a long bulky-weight sweater that ends at the midpoint of my thighs is REALLY NOT a good look for me. In reality, it probably looks ok, but I've spent far too much of my life unhappy with my shape to be happy wearing something that doesn't make me feel fabulous. So, yesterday I heeded the advice of my extremely talented college classmate and Let It Go. I got out the ball winder and reduced my 90% finished gorgeous sweater into a whopping pile of potential. That is about 600 grams (or just over 900 yds) of lovely red tweedy Elann Highland Chunky (sadly discontinued), which has now been reskeined, given a bath, and is drying over the kitchen radiator as we speak. I've already got plans for this yarn - another sweater, but more or less the polar opposite of Automne in a design sense. And I'm looking forward to casting on. Maybe it will be done in time for next week's predicted ridiculous winter weather? Here's hoping! 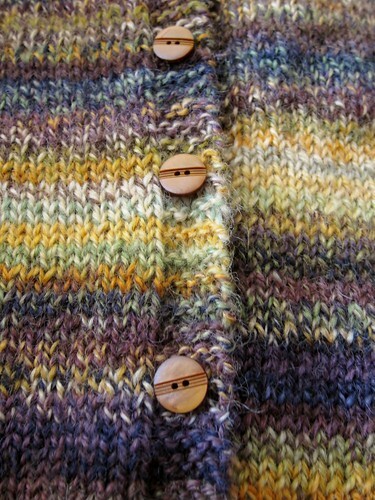 When I finally finished knitting my handspun Garter Yoke Cardi, it took me a little while to find the right buttons. Which meant I had a lot of time to think about how the buttons were going to go on, and how I wanted the final sweater to look. 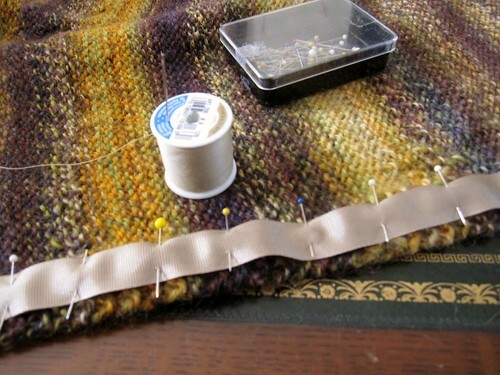 I'd read that putting a ribbon backing on a handknit button band was a good idea for a few reasons: 1) it stabilizes the band and keeps it from stretching with the weight of the buttons, and 2) it gives you a solid surface to sew the buttons to. Somehow, I'd never managed to actually do a ribbon backing, but this time around I was in a finicky kind of mood, I guess, so I picked up some ribbon along with my perfect buttons. , so I watched some of that and then winged the rest of it. 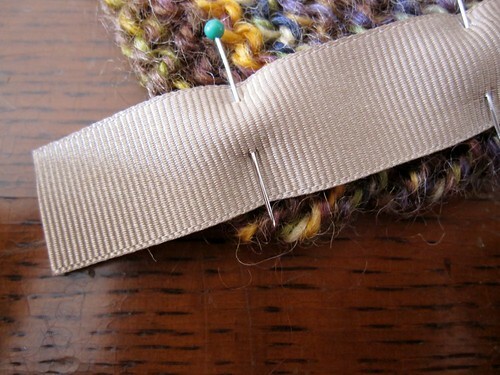 Step 1: cut the ribbon to length and pin. 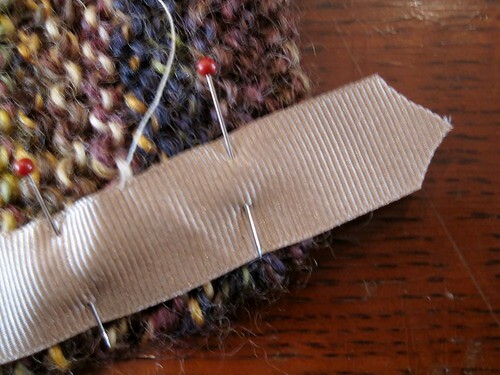 I laid out the sweater and cut the ribbon so that it was about an inch longer then the buttonband on either end. Then I pinned it using waaaay more pins then most people would consider necessary. 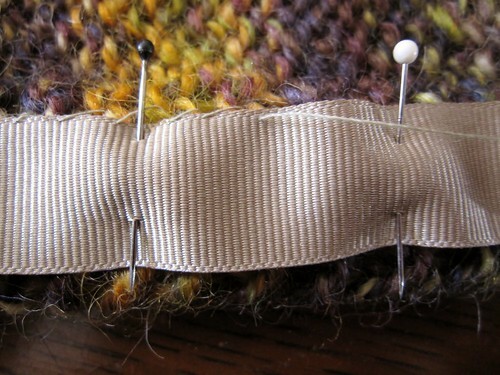 and continue sewing as established around the end of the band and back down the other edge. 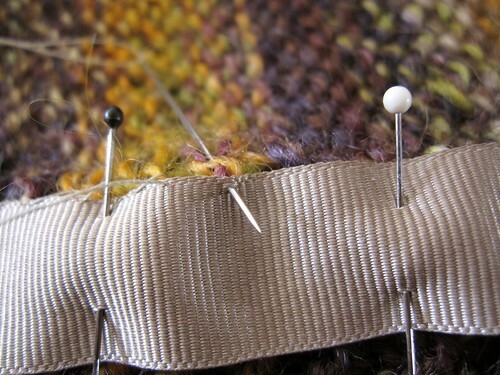 Repeat at far end, finish off, tie knot, trim thread and voila! Finished buttonband ready for buttons. I have no data yet to report on whether or not this is a more effective button band treatment in terms of stretching, given that it is not yet Romney sweater weather here in the UK. It certainly feels more stable then a non-backed button band. Give me a month and I should be able to discuss whether or not the extra couple hours* worth of finishing was worth it. It was definitely easier to sew the buttons on since I didn't have to worry about the end of the thread pulling through or the stitches getting all distorted. * To be fair, that time includes going out and getting the buttons. I'm not that slow a sewer! 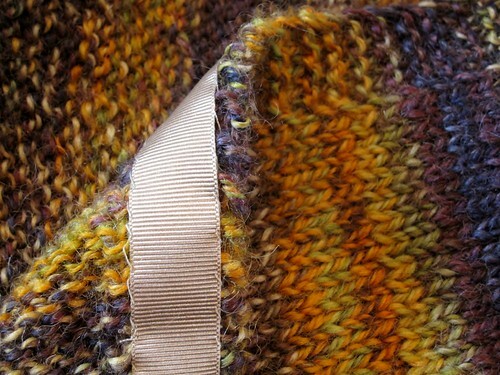 The yarn I'm using for the Endpaper Mitts is reclaimed from two sweaters I picked up for cheap at Goodwill. I've now found another source for recycled yarn: previously knit sweaters. Since the yarn is basically a softly spun single, not a plied yarn, it's not terribly strong. I must have caught the edging on something and it broke the yarn. Now, in and of itself, this is not enough of a reason to frog the sweater. But I've been thinking about knitting something else from this for a while. First of all, there's no shaping to the sweater. It's straight up and down and basically just hangs there when I'm wearing it. And it doesn't do a lot for my body honestly - I'm not exactly svelte, and I think that it would look better on me with a bit more shaping. 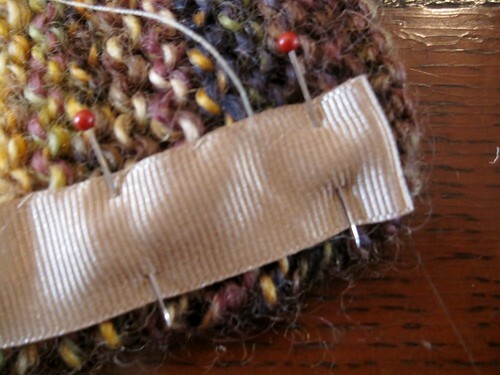 I also am not a fan of the seed stitch bands - they are a bit loose and floppy, and don't feel substantial enough. I've decided to frog the sweater and use the yarn for something else. Initially, I was thinking about a top down V neck with set in slightly belled sleeves. But after last night's Mr. Redjeans fiasco (finished ribbing, bound off, tried on and realized that A) clearly the designer did not have my figure in mind when she had us switch to size 7 needles for the ribbing*, but I really don't need to display that much of my tummy, B) it was going to be too short in any event, and C) clearly in my mind I am still in my pre-pregnancy, half-Ironman body, not my post-two kids-still-lactating body - I'm going to have to go up a size), I'm thinking that I may soon be working on Mr. Bluejeans, while Mr. Redjeans gets to wear a set of concrete galoshes. * this is nicer then saying she was smoking crack because really, the ribbing was going to pull in anyway with the cables. Why have it pull in more with smaller needles? In my fevered rebound period after creating the Blue and Purple Monkey costumes, I cast on for two items for myself. One was the Bandwagon, which is now done. The other was Mr. Greenjeans, which I've been working on off and on for the last few weeks. I have rationalized this departure from The List at such a critical time by protesting that we're going to New England for Christmas, and since we've now been in Texas for five years (swoon), I am in sore need of a new sweater. But I'm greatly enjoying this project - mindless enough to be good for downtime, interesting enough not to be boring. The yarn I'm using is Durango from Colorado Yarns. It's mostly acrylic, but is really soft and knits up into an incredibly cuddly squishy fabric which I'm loving. The red tweed helps give it some interest.It's pretty simple - easy TV knitting - except for the cabled section at the bottom of the body and sleeves. I'm about halfway through the cable and rib section of the body, and I'm hoping I don't run out of yarn for the sleeves! I got ten balls of this from Webs at the end of last year (before TGYD07 started of course), so if I run out, I'm kind of out of luck on dyelot and all. Maybe the sleeves will end up being a bit shorter. Or narrower. Or something. Anyhow, with this on the needles I'm having a hard time attending to the task at hand. Hopefully I'll finish soon so I can get back to The List.